I wasn't planning on reviewing this album which I recently picked up used. When I found out Lightning Hopkins' Texas Blues Man was a reissue from 2016 I hesitated a moment further in considering writing this up. But then as I listened I thought... well... this is really great music and it sounds pretty remarkable so why not tell some folks who may not be aware about it? 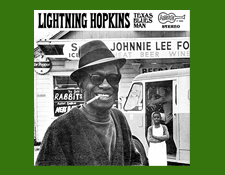 Originally released in 1968, Lightning Hopkins' Texas Blues Man is a very simple Stereo recording made by Arhoolie Records founder Chris Strachwitz on portable equipment (recorded December 18, 1967). If it sounds like it was made in someone's living room, there is a good likelihood it may well have been! Arhoolie Records began as something of a passion project, growing steadily over the years and now owned by Smithsonian Folkways Records which has been reissuing many of its classic titles. 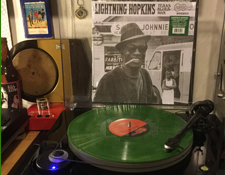 When I put on this lovely green splatter colored vinyl LP of Lightning Hopkins' Texas Blues Man I was kind of taken aback how fresh it sounded. It is just electrified guitar and vocal. Pure impassioned gutsy blues. Amplifier tone. Gritty vocals. You and the man in the same room together. The real deal. So why do you, Dear Audiophile Review Readers, need Lightning Hopkins' Texas Blues Man? Because it sounds really good if you like this sort of rustic raw stripped down take on the blues! 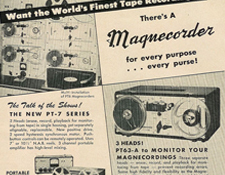 I did a little poking around and it seems by the mid-1960s Mr. Strachwitz had upgraded his gear to a "Magnachord" brand recorder with a "Capps" brand omnidirectional microphone (click here to read more about that). Those Capps microphones might have been tube condensor types and if the original Magnacord recorders were tube driven then it stands to reason these old "field recordings" on the Arhoolie label might well be a source of much of bliss for those of you who relish this sort of analog purity. 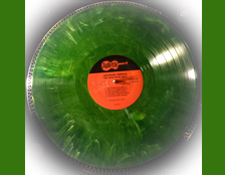 And for those of you who are haters of colored vinyl, don't be thrown off by it here. My copy of Lightning Hopkins' Texas Blues Man is thick and sturdy -- probably 180-gram, though the package doesn't say. It plays super quiet and is well centered. The album packaging is very much in keeping with what original Arhoolie pressings I have seen look like. The labels are period accurate in design (albeit orange in color, not red... but otherwise they look right). But... well. ... from this review I hope you get the idea that there are some pretty cool recordings on Lightning Hopkins' Texas Blues Man which you might want to check out. While this album isn't up on Tidal, there are a bunch of other Lightning Hopkins recordings up there. Right now as I am finishing this review, I'm sampling another Lightning Hopkins album which has also been reissued recently. Some killer acoustic blues playing here. I'll probably be getting this reissue as well soon.